Is E-mail Bad for Your Health? If you find yourself obsessed with monitoring the near-constant flood of emails arriving in your inbox, you could be harming your health. Researchers from the Future Work Centre in England surveyed nearly 2,000 employees from a variety of industries about their experience with email and found high levels of stress among those who practiced particular habits, such as leaving their email on all day, using “push” email, and checking for messages early in the day and late at night. “Our research shows that email is a double-edged sword,” lead study author Richard MacKinnon said in a statement. “Whilst it can be a valuable communication tool, it’s clear that it’s a source of stress for many of us. The people who reported it being most useful to them also reported the highest levels of email pressure. But the habits we develop, the emotional reactions we have to messages, and the unwritten organizational etiquette around email, combine into a toxic source of stress which could be negatively impacting our productivity and well-being,” he said. MacKinnon’s team found that almost half of those surveyed allowed emails to be sent automatically to their inboxes and 62 percent kept their email on all day, habits that can produce unwanted stress. Earlier research has shown chronic stress can produce inflammation, leading to a variety of chronic conditions. 1. Put your phone away when you’re away from the office so you’re not checking email constantly. 2. Plan your day and prioritize your work before digging through email messages pushes you off schedule. 3.Turn off your email for part of the day and set aside time to read and respond to messages as part of your daily schedule. Alex Soojung-Kim Pang, author of The Distraction Addiction, offers more tips on managing your relationship with digital devices in “Intentional Computing,” from our October 2015 issue. nless you’re very young or very old, it’s likely you have some kind of relationship with email, whether you get hundreds of messages a day or a few dozen a week. A new study suggests that how we deal with these incoming messages could be affecting our stress levels and overall health. A team from the Future Work Centre in the UK surveyed close to 2,000 people across various industries, sectors, and job roles, asking participants how they managed their email and how much associated stress they felt as a result. Overall, those who spent the most time organising and staying on top of messages felt the most email-related pressure too. “The habits we develop, the emotional reactions we have to messages, and the unwritten organisational etiquette around email, combine into a toxic source of stress which could be negatively impacting our productivity and wellbeing,” he added. The report is available to read in full online. 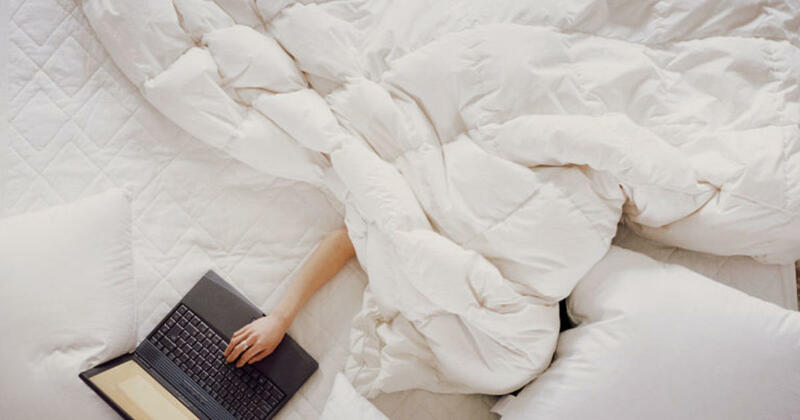 Two of the habits linked to more email-related stress were checking for messages first thing in the morning and last thing at night. Nearly half of those surveyed had push notifications set up for new email, while 62 percent of respondents left their email app open all day. Both were linked to higher levels of perceived email pressure. The survey also found that managers suffered more than non-managers. Stress is not just a problem when it comes to our mood – it’s been linked to a slew of disorders such as heart disease, weight gain, memory impairment, digestive problems, and depression. The researchers suggest that an individual’s personality acts as a moderator between perceived email pressure and work-life balance: in other words, the relationship between email-related stress and the negative impact on home life is not the same for everyone. MacKinnon admits there’s no ‘one-size-fits-all’ solution, but recommends turning off email notifications or planning the day before checking for new messages if you find the email pressure getting too much. There’s a growing body of research indicating that this ‘always-on’, constantly connected work culture is actually making us less productive. A 2014 study by researchers at Stanford University found that a 70-hour work week doesn’t necessarily result in more getting done than a 55-hour work week. Running ourselves into the ground is looking more and more counter-productive, both for us and the people we work for. Not only does working too hard for too many hours cause stress on our emotions and physical bodies, it often cuts down on the time we spend asleep: time that’s essential if we need to successfully recharge our batteries and stay on top of our workloads in the first place. So close your email application and treat yourself to some downtime – chances are the quality of your work will improve while your stress levels drop.